The Koda Cross Body Bag is the perfect size for any event. Approx. 9 1/2″ H by 10″ W with a front zipper pocket for your phone. A top zipper closure keeps the rest of your possessions safe and easy to access. The pattern is for vinyl/cork or leather exterior and décor weight fabric lining. No interfacing is needed. If you want to do the bag in cotton then you will need to add interfacing, fleece or foam where needed. Needed Vinyl, Cork or Leather – approx. ¼ yard or less. Décor weight Fabric e.g. drill, canvas – approx. ¼ yard or less. 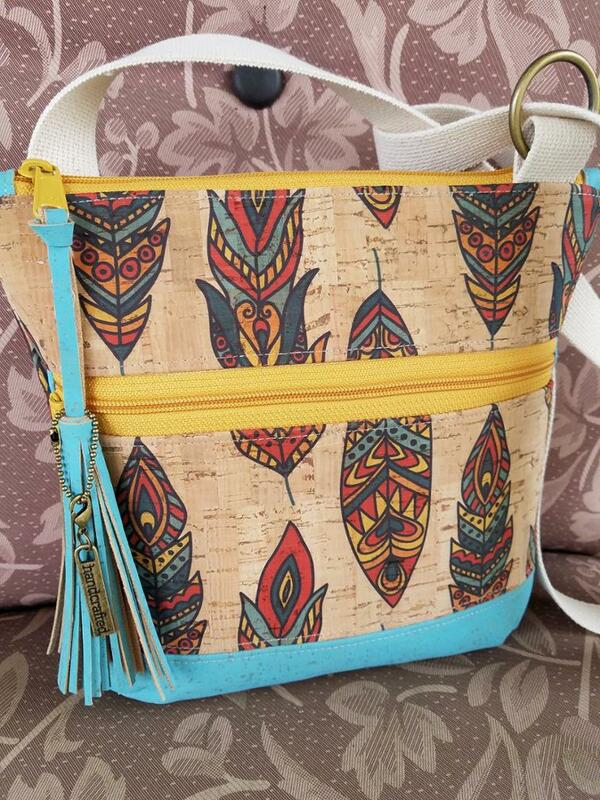 Another bag that you'll surely love is this Small Canvas Tote Bag. Check the tutorial HERE. Really pretty. I probabiy will make this or at least on my to do list. Very nice bag, especially the front phone zipper pocket. I have been trying for months to resubscribed to sewing for free dot-com and have not received a reply from anyone. When I try to subscribe it says my email has been unsubscribed and cannot be resubscribed by me. What can I do to have access to your site?